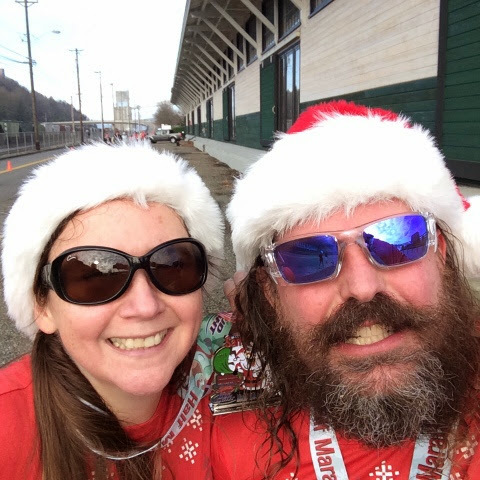 I like a holiday-themed run. There. I've said it. I like putting on stripey tights and a Santa hat (which I always find annoying after, oh, 5 minutes) and running with a bunch of festive folks. 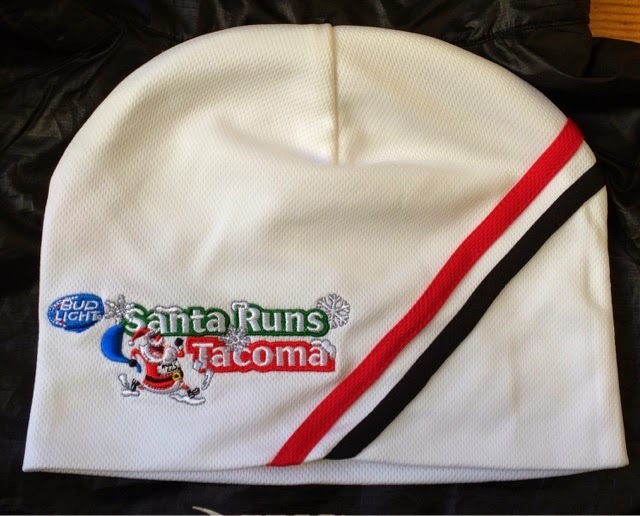 We ran the Jingle Bell Run way back in 2007, attempted to run the 12Ks of Christmas in 2008 when the race was cancelled due to snow. (And, while you can't control the weather, you CAN control your website messaging... or your outgoing phone message. Ahem.) 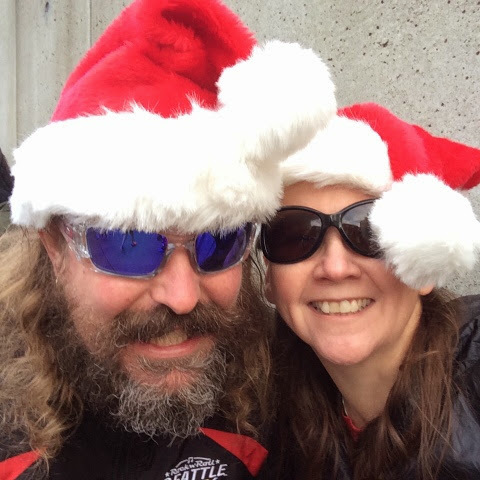 And then, during Wil's 40@40 project, we ran our own Happy Christmas Half Marathon on Christmas morning in 2012. 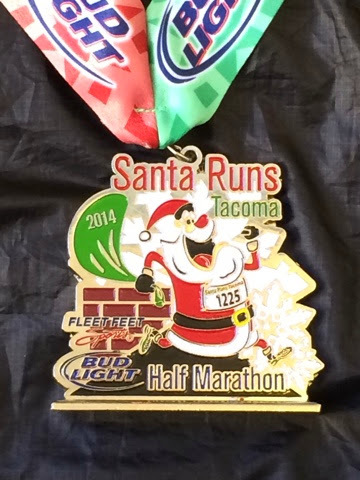 So I was really happy when the Santa Runs Tacoma added a 21K distance to their event this year. 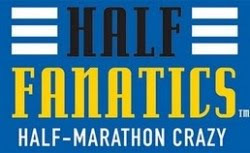 It seemed like a great opportunity to squeeze in one last half marathon this year. And, yes, WEAR OUR SANTA HATS!!! Drove down to Tacoma -- the race had a very civilized 9am start time, so we didn't even have to leave super early. I both love and feel a little sad for downtown Tacoma -- beautiful old buildings and lots of empty holes in the ground. 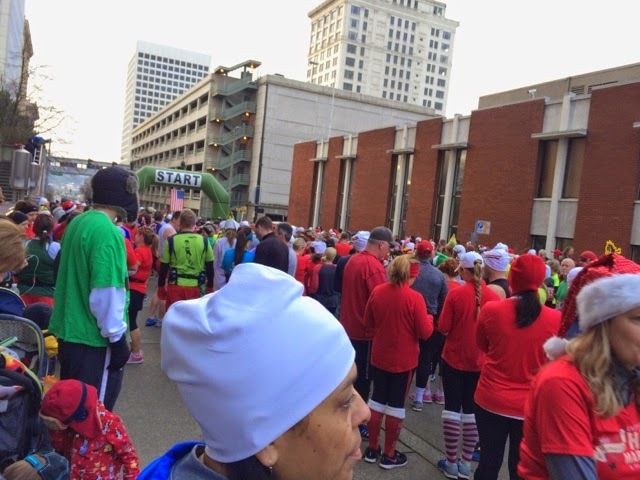 But, still the weather was glorious -- a bit bracing, but a perfect morning for a race! Nope, that's not a swim cap, though it does look a lot like one. Just a weird, very thin beanie. I can't bring myself to post a picture of it "in use" -- because it was just too weird looking. I think I would have preferred a headband. Or a pair of embroidered gloves. 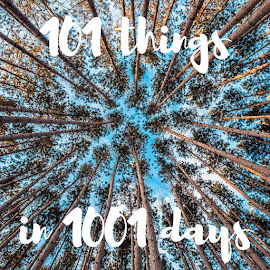 Or... nothing. No, that *isn't* a swim cap. Nor is it warm. Then it was time to go. 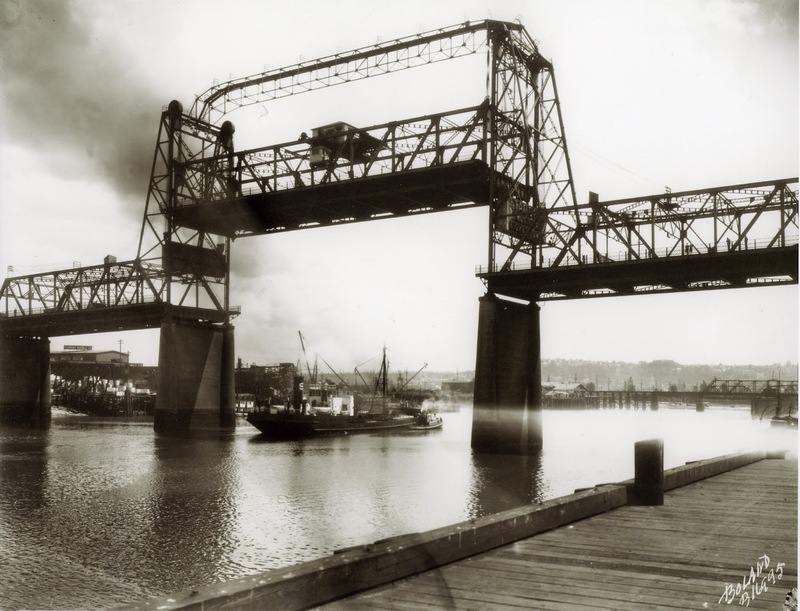 The highlight of the race course came early -- we ran across a wonderful old bridge which was originally built in 1913 as the "New Steel Bridge", later renamed the 11th Street Bridge, and rededicated as the Murray Morgan Bridge for its centennial. 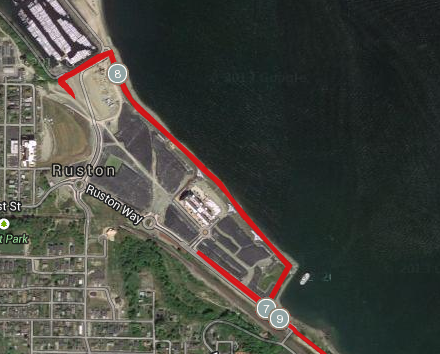 After the bridge, we did a loop around the waterfront area, running next to the Museum of Glass and some swanky new(ish) housing. 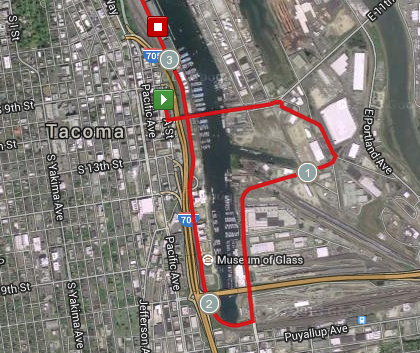 The course then just followed Schuster Parkway and Ruston Way. 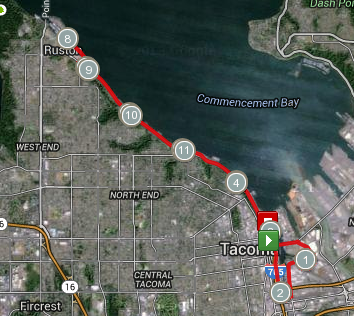 I was a little surprised at how good I was feeling for most of the along Ruston Way. My foot was feeling okay, I felt strong, and we were making good time. But at around mile 6, it sent me a little message, saying, "Umm, hi, remember how you were supposed to be resting? Yeah. About that." I started thinking about when I might want to stop running and walk... which is always a bad thing, because then I mentally give up. Luckily Wil has having similar thoughts. We decided that we would run to the turnaround... so imagine how grumpy I was when the "turnaround" was really a weird double-out-and-back that stretched over 2 miles. When we made the turn into the Point Ruston development, Wil said, "Let's run until we leave the park"... not realizing that it would be quite so far. So, in the end, we ran until almost mile 9, then happily settled into a comfortable walk. We saw the 2:20 pace group go past, then the 2:30. Sigh. (Okay, maybe we weren't quite so happy to be walking?) Still, one particular highlight: We always make a point to thank volunteers and the police officers who control traffic on the course. One officer said, "Love the matching outfits. Especially on you, sir." Awesome! But we went over the final overpass (I do love a working rail yard, which I realize as I type makes me a complete nerd), spotted the finish line, and trotted across holding hands. We got our handsome medals, grabbed a banana and some water, a couple of cookies in the Half Fanatics tent, and then skedaddled. Amusingly, the finish line was far from the start -- so we had to figure out how to get back to downtown. Hurray for the Murray Morgan Bridge, yet again! Except, oh. Wow. - the Murray Morgan Bridge, of course! Not sure we'd necessarily run this race again, but I can recommend it to anyone looking for a small, well-produced event in December. 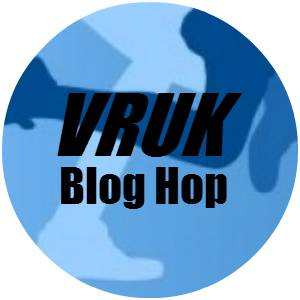 I'm participating in the Virtual Running UK Blog Hop - hop on over and check out the other blogs! So, it's almost the end of the year?